View More In Ball Ornaments - Page 6. Witch Balls (SM 4 Inch Diameter) For over two hundred years, the superstition behind Witch Balls has traveled from England to New England. The magic of a Witch Ball is to ward off evil spirits, witch's spells, and ill fortune by capturing them in the hollow interior. As the spirit is mesmerized by the ball's color and reflection, it enters the ball and is caught by it's weblike inside. Our glass Witch Balls are made from recycled glass in the Carpathian Mountains; the land of superstition, old world mystery and storybook folklore. As the ball is molten hot, the glass is formed, the ball is rolled into colored glass granules to provide the design. With this process each of our Witch Balls are uniquely handcrafted and no two are alike. Let the magic of our Witch Balls decorate your home. Small Witch Balls are a new product for us and we took at different approach for this size so that the vibrance of the color really stands out. For instance, unlike our normal and extra large size witch balls, small witch balls are 100% covered with color. This Steel Blue Witch Ball is four inches in diameter and a popular design coloring of deep blue. These small witch balls look best in the sunlight where they really sparkle and the 3 to 5 glass strands inside are prevelant. 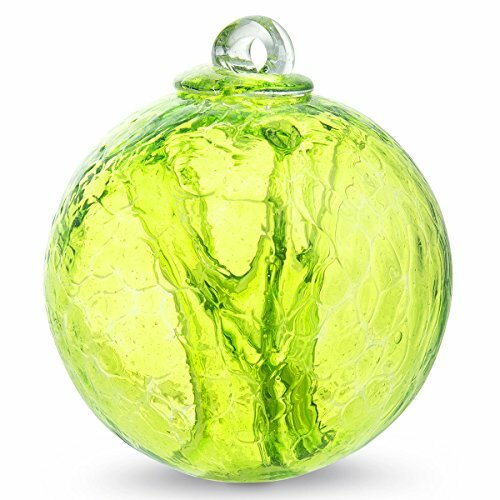 Iron Elegance provides to you the World's Largest Selection Witch Balls, Friendship Balls, (Kugels) and other handcrafted art glass ornament designs. Iron Elegance's Mouth Blown Glass- Each One Handcrafted, Unique and produced with Earth friendly recycled glass and production processes. Using the finest German glass overlay colors. Dimensions - 4 Inches Diameter. Please note that each item is handmade, by individual artisans; each of them leaving their own individuality within the creation. Differences in color saturation, construction and bubbles are attributes of genuine handmade art glass. Folklore suggests that witch balls can be used to ward off evil spirits, nasty witches spells, ill fortune or just all around negativity and bad juju. Mesmerized by the color and reflection of the ball, it is caught within the web-like strands and deemed harmless. One can never have too many! Collect them all! New in Box - Over packed and double boxed for reliable delivery. If you have any questions about this product by Iron Elegance, contact us by completing and submitting the form below. If you are looking for a specif part number, please include it with your message.